I used to be a part time projectionist at the old 55 when the Goldfarb Corp owned it back in them mid 70's. They used to own theaters all over northern Michigan. Which included the 55 Hi and the Gaylord Drive in at the corner of McCoy rd and old 27. The address is wrong. It would have been 91xx W. Lake City Road; 4287 was the address of the other drive-in out in Prudenville. I got some pics today of the drive in my self while I was at a snowmobile show next door and the motel, I did my best to get the pics but their was a no trespassing sign, which did not leave me anytime to look around. still it was cool to set food on an drive in for the first time in my life. I remember attending this drive-in, as it wasnt too far from Gladwin, and one night I drove up to borrow a box of carbons for Meredith and got to see the booth. 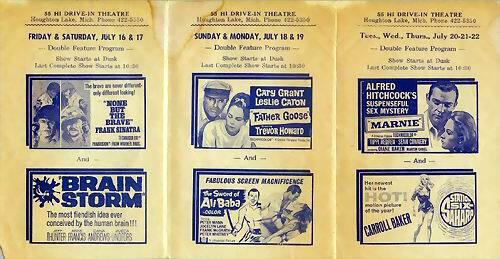 The hallmark of an Olsen theatre was the generally superb, well-equipped projection booth, and this was no exception. Brenkert, or RCA BX100 heads, RCA 9030 soundheads, but also RCA stereo heads as well. Its a shame the 55HI isnt there anymore, for it was a beautiful facility, as any old time Houghton Laker will tell you. I think it might have been larger than 250 car capacity, because it was bigger than Meredith was, or so it seemed to me, and Meredith had 350 car capacity. I recall vacationing in this area about 76 or 77 and poking around the abandoned remains of this Drive-In. It was very close to the interchange for M-55 and US 127, near a cluster of restaurants and related businesses. It looked at that point as if it had been closed for quite some time. The screen tower was quite substantially constructed, with some artwork depicting some cartoonish chipmunks or squirrells, who were also on the marquee sign (which was laying in the tall weeds in the middle of the lot as I recall) The letters 55-HI stood the entire width of the tower, although they were badly faded. The concession stand was still intact, but it seemed to be of a more recent construction than the screen tower--it didnt jibe architecturely with the screen tower. 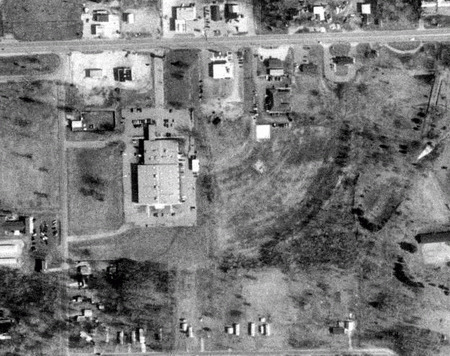 On my next visit to the area, (circa 1982) it was completely gone without a trace. 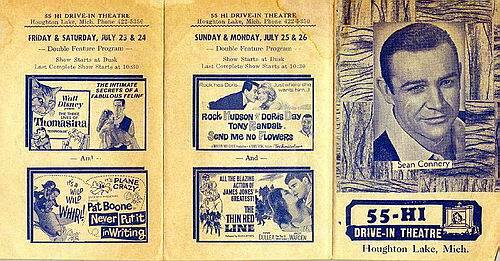 The D/I pictured here (ref:Northwoods Drive-In)was on the other side of town I think. Hope some of this is useful. (Andrew 11-6-02). A recent site inspection reveals that some ramps are still visible and there is a nice amount of poles stacked on the lot. It looks like some work is being done on the site which will bury the old drive-in forever. This Drive-In had a fairly large screen which had 55-Hi in huge letters on the back of the screen.